They flew six more missions in August in a variety of 752nd Squadron ships. In early September, the 458th (and several other 2BD groups) was pulled off of combat operations and assigned to fly gasoline to Patton’s army in France. These “Truckin’ Missions” did not count towards the crew’s total of sorties needed to rotate home, although some thought that flying a Liberator overloaded with high octane gasoline presented more danger than the Luftwaffe did at this point in the air war. 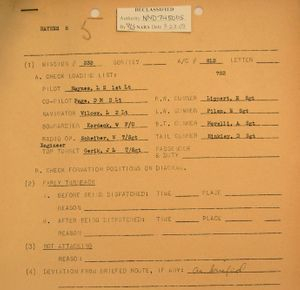 Haynes is recorded as flying one of these cargo missions on September 23, 1944. The group was back on operations after the beginning of October, but for unknown reasons, the crew did not fly their next (7th) mission until November 8th. 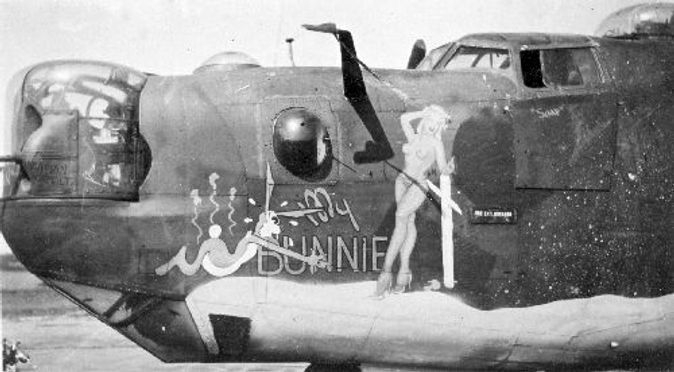 They continued to fly a variety of 752nd ships until December 4th when they were assigned a NMF (Natural Metal Finish) B-24J that had been flown on about 15 missions. 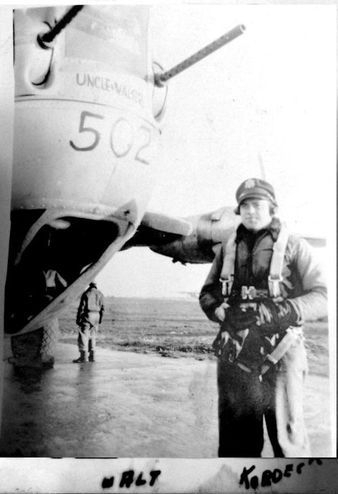 Walter Scheiber recalled, “After our 13th mission, our crew was assigned B-24 42-50502, which our pilot named Larrupin' Linda for one of his girlfriends. During our tour our plane, Larrupin' Linda and others, )among them Final Approach, Here I Go Again, Wolves' Lair, Jolly Roger, Princess Pat and You Can't Take It With You), was hit numerous times and lost various engines, and its electrical system, but I have a feeling that our tour was fairly average, except for one crash-landing in France.” That crash landing occurred on December 31st on a mission to Koblenz when they lost an engine on the bomb run and couldn’t get it feathered. They were able to make it to an airfield at Lille, France. When they finally returned to Horsham they found their belongings had been packed and quarters reassigned, as they were listed as MIA! 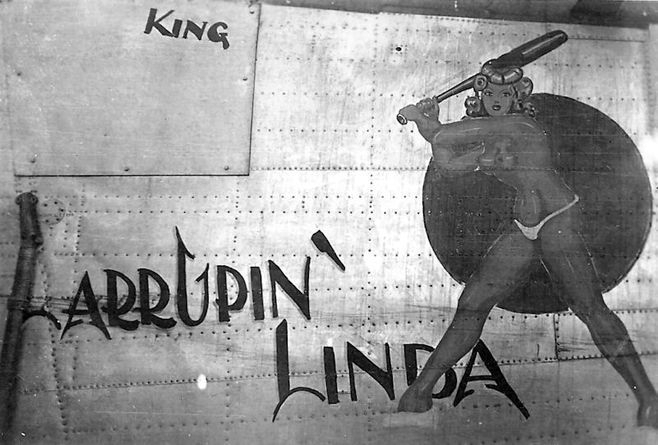 The crew flew Larrupin’ Linda on 19 of their 35 missions, flying only three different aircraft in 1945. 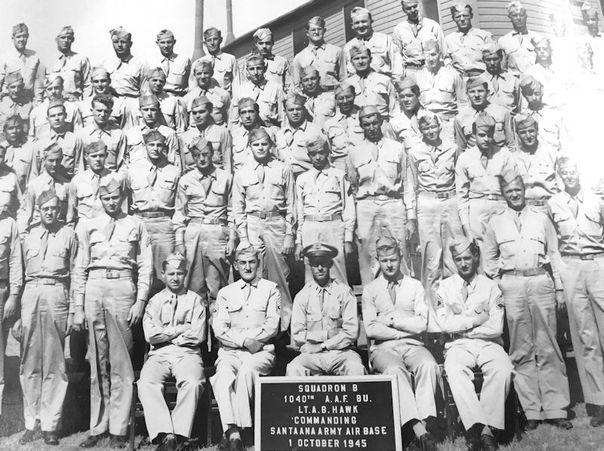 On January 24th, after flying 21 missions, the entire crew was sent on Rest Home Leave. What would normally be a break of 7-10 days, apparently ended after only five, as Haynes is shown flying again on January 29th. In February, bombardier Walter Kordeck was transferred to the 755th Squadron to be a pilotage navigator. At this point in the war, it was feasible for bombardiers to fill this position and to toggle the bombs on the lead aircraft. 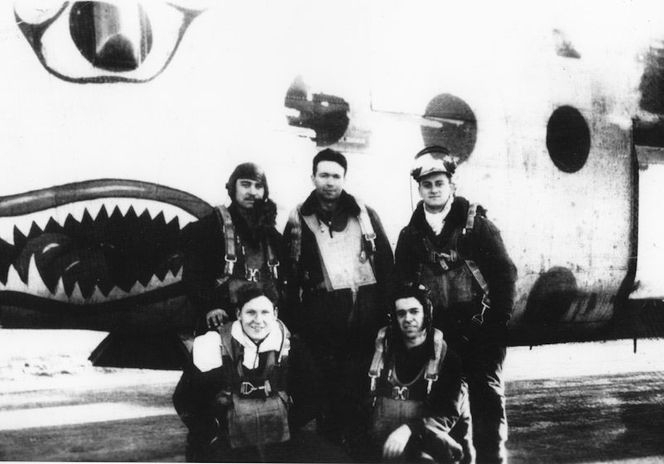 Haynes’ crew flew the remainder of their combat sorties with a nine-man crew. Their 35th and final mission was on March 18, 1945 to hit an ordnance plant in Berlin – the crew’s first and only trip to the German capitol. A mission to Berlin was never an easy one, and for one member of the crew, this turned out to be true. 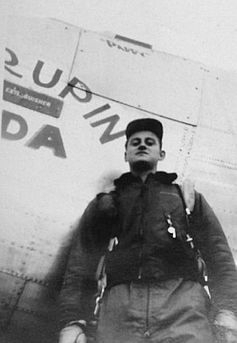 S/Sgt Eugene Pilon was manning the tail turret and picked up a piece of flak in his foot during the bomb run. This was, as far as records show, the only combat injury to any of the crew during their 35 trips over the Continent. 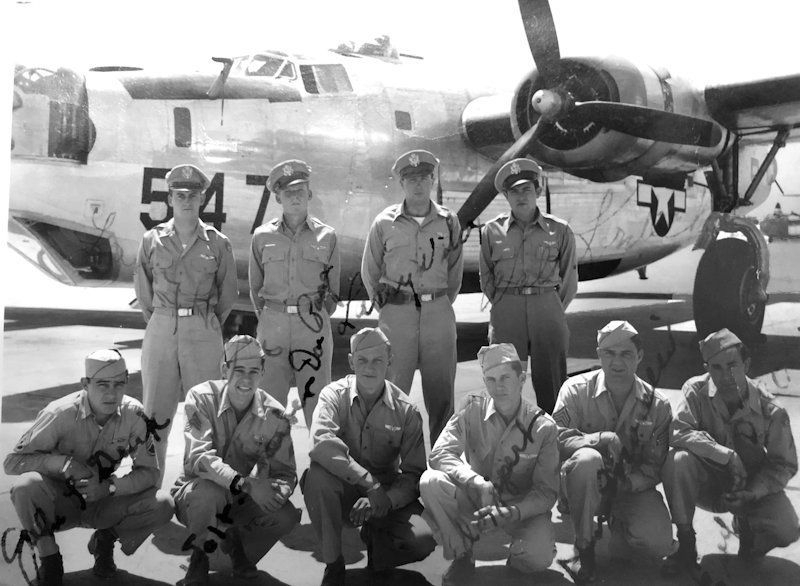 After completing their combat tour, most of the crew would have been released from flying status and shipped home for leave before reassignment. Two exceptions were Eugene Pilon, who appears on a May 1, 1945 roster of 752nd Squadron personnel. He was probably still recovering from his wound on March 18th. Walter Kordeck, having been transferred to be a pilotage navigator, would not have flown as often and was still on base when hostilities ceased. He is listed on June 7, 1945 orders as a crewman ferrying a Liberator back to the States with 1Lt Kendrick E. Ferriell and crew. The following is a diary submitted by Larry Haynes, son of pilot Laurence Haynes (pictured at left). It is presented here as written, although some words have been corrected. 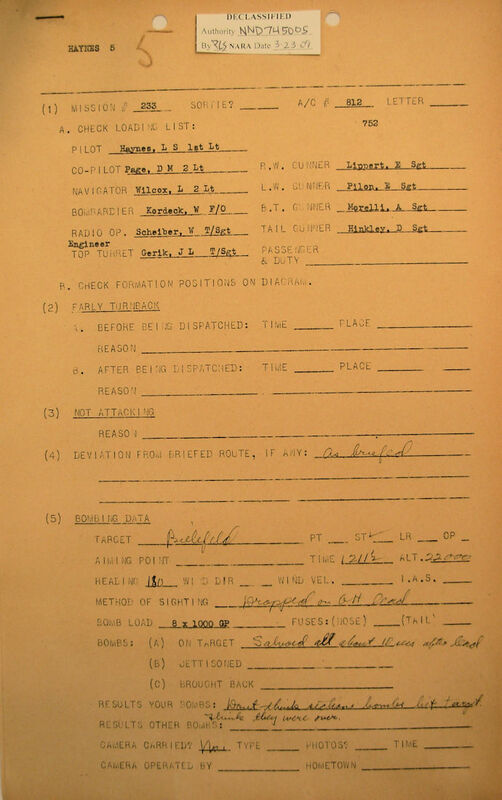 This log was used to confirm the accuracy (or lack thereof) of the mission list above, which was compiled from 458BG records. Where differences have occurred, I have made note in the comment section of the Mission List. Remarks: Good, but pretty rough. Our ship collected minor battle damage. Remarks: Dropped 30 seconds late, and blew up a barracks, went off course over Rotterdam on return and accurate Flak split up formation, sweated our gas out. Remarks: Took off at 3 pm with 18 ship formation. Target wasn’t picked up by bombardier on first run and we picked up moderate accurate flak several miles past MPI. We made a “180” and a second run on the target, proceeding to drop our bombs in a river which runs past the plant. Pity the poor taxpayer. Remarks: Bad cloud formation snafu'd assembly. We hooked onto the 453rd formation. However, they failed to drop on the primary, eventually jettisoning their bombs into the Zuiderzee. We didn’t have a bombsight, but we made a run on a city near the Dutch border. The monsoon proved that his middle name wasn’t “Norden” after all, as our bombs dropped several miles short, blowing up a Kraut farmhouse. Remarks: We had our troubles: Morelli’s Oxygen mask froze, and he passed out. Then we lost the flight deck oxygen system after sweating out our gas. We made the base without further misadventures. Photos of the target showed that we overshot our MPI (we were supposed to post-hole the field) and hit hangars and repairs shops. Remarks: This was part of the “Softening up” process before the 19th army jump-off at Aachen. The whole 8th A. F. bombed in a 3-mile square area. Weather was bad at takeoff and we joined the 93rd bombing with them. We were diverted to Hartford Bridge R.A.F. Station on return at which base we spent a lousy two days before returning to Horsham. Remarks: Photos show that we dropped 2-1/2 miles SSE of MPI, in a park. However, 466th and 467th really creamed the joint. Remarks: A record number of 8th A.F. bombers made this mission, and the whole 2nd division attacked this target by instruments. However, nobody managed to hit it. We shoulda stood in bed. Remarks: Three squadron's bombs landed in the town, but the high high right, led by Sullivan hit right on the money. We had to feather #4 at one target, but had little other trouble. Remarks: Gee equipment went out on the bomb run, and as we had passed the secondary target by that time, we brought our bombs back. This aircraft was repaired and returned to Horsham St. Faith in late February 1945. Remarks: We lost #2 on bomb run, and turned back, but couldn’t feather it. It continued to windmill and caused bad vibration. Finally, just as we were about to bail out the prop froze and we were able to crash land at Lille. Hitched a ride back to Horsham with the R.A.F. Back at base found all our gear packed & quarters reassigned as we were listed as MIA. Remarks: This was a rough one, but the bombs were right on the MPI, for a change. We lost #1, and straggled back – right over Dummer Lake, where the enemy fighters were forming. 8th A.F. fighters got a record bag in the air on this date. Remarks: This was our secondary target and was bombed because visual conditions did not prevail at the Rothensee oil refinery. Enemy opposition was meager and it turned out to be an easy mission. Bombs: 6 x 500 GP’s & 6 x M-17 Incend. Remarks: Scope photos indicate that the group dropped about 1/2 mile short of the MPI. Some flak was encountered at the front lines of withdrawal. It was an easy mission. Remarks: We nearly tore the roof off the pub on take off, but the rest of the mission wasn’t bad. We saw little flak at the target, some at the front lines. Recon photos showed that only 3 of the 11 groups that bombed this target dropped in town. 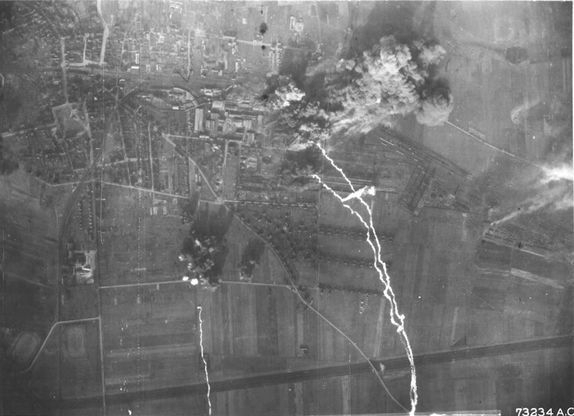 February 22, 1945: Bomb strikes from an unknown group on the marshaling yards at Peine, Germany. The 458th lost two aircraft on this mission. Remarks: This was the famous low-level mission. Our part of it was a nightmare. En route, we encountered accurate flak at Bebra, and 2 ships in the flight squadron had it before they knew what was happening. Hess nearly got it, too. That’s enough, brother. 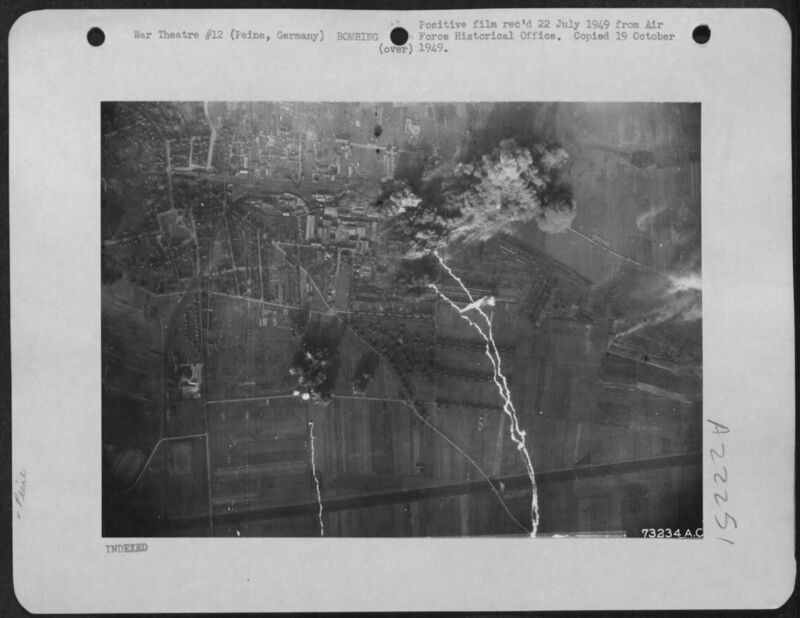 Remarks: We lost #3 just before reaching the German border, but continued in and dropped our bombs on a target of opportunity. We then feathered #3 and returned to base without further complications. Remarks: Nobody hit the target, even though there was a visual assist. It was an easy but not satisfying mission. Remarks: This was a target of opportunity selected, when we couldn’t get through the clouds to the primary. There was complete cloud cover at Stuttgart, and no flak burst too close to us. The MPI was the center of Stuttgart, and the consensus is that we must have beaten hell out of it. Remarks: We led the trail element of the 467th’s 3rd squadron. The 467th dropped about 3000 feet off the MPI, but just after bombs away a concussion was felt. It’s believed to have been the explosion of the ammo dump, which must have damaged everything in the vicinity. The lead squadron of the 458th overran us on the bomb run, and couldn’t drop. The following squadron dropped 23 miles off the MPI. The 458th’s 3rd squadron didn’t drop. Bombs: 52 x 10 Indec. 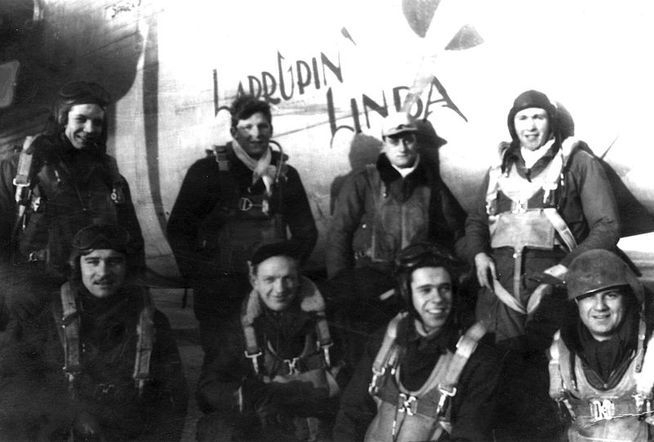 Haynes and crew flew Larrupin' Linda on 19 of their 35 combat missions. 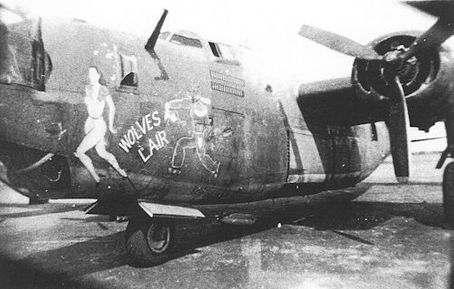 According to radio operator, Walter Scheiber, "After our 13th mission, our crew was assigned B-24 42-50502, which our pilot named "Larrupin' Linda" for one of his girlfriends." They were forced to abort one mission on March 15, 1945 while flying this aircraft, due to mechanical difficulties and were not credited with a sortie. The crew made it to the Zuider Zee (now called the IJsselmeer) before having to turn back. See Abortion Report for that date. Kordeck was transferred to the 755BS in February 1945 as a lead navigator. 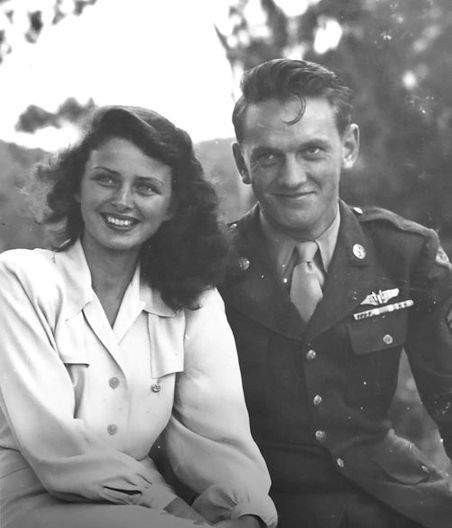 Upon his return to the States in 1945, Donald Hinkley was assigned to the 1040th AAF Base Unit at Santa Ana AAB in California. 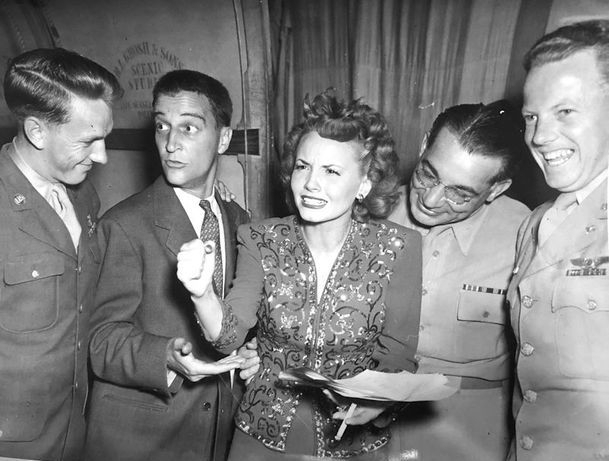 1945: Donald Hinkley (left) with what appears to be a Public Relations group and an unidentified movie star. 1945: Donald Hinkley with another unidentified movie star.